The english version of the site is not fully completed yet, but in order to provide you the most important information, we have translated frequently used manuals and basic information about us. If you need more, please do not hesitate to contact us. SMART, spol. s r.o. is Czech company with tradition in development and production of measuring, analytic and regulation devices since 1992. Our major activity is long-term cooperation with production and wholesale companies, for which we develop and produce components, technological units and control software, including their proving and certification tests. One of our latest project of this type was cooperation with NEPA, spol. s r.o. company, for which we developed control unit of Sinclair S-Therm+ heat pumps, including embedded and extension software for secured communication over the internet. After successful tests in certified laboratory and several exhibitions, first tens of installations are deployed in residential and industrial buildings in Czech and central Europe. 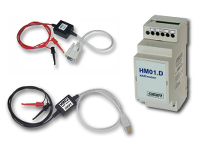 Besides of well known variants of HART modems HM01 and HM02, we have prepared a new version called HM01.D, which is intended to be build in the measuring circuits or PLC controllers, using a standardized DIN rail. At the same time the modem performs voltaic separation of measuring circuit from connected device.